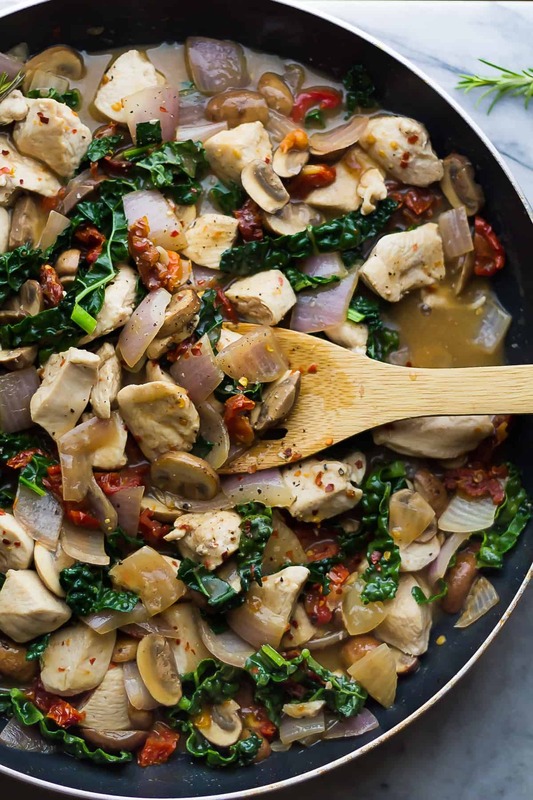 A rustic Tuscan chicken skillet that is full of flavor and ready in under 30 minutes. Don’t forget to serve with a chunk of bread to sop up the sauce! How was everyone’s Halloween? We took Kai trick-or-treating for the first time ever and let’s just say…he’s a natural. It was SO cute to watch him enthusiastically running up the steps to ring the door bell and skipping back down. He wasn’t even worried about eating the candy, he was just 100% preoccupied with collecting it. But eventually we came home and he lined up all of his treats and picked the one he wanted to try: Smarties. Only problem? He can’t pronounce ‘sm’ yet. It comes out as ‘f’. So Kai politely asked if he could eat the ‘farties’. Then he looked at Mom and Dad and wondered why we were laughing so hard that tears were running down our faces. Guess what day it is today? It’s 30 Minute Thursday, HURRAY! For today’s recipe, I set out to recreate the flavors of this Slow Cooker Tuscan Chicken Stew in skillet form…but the carrots and celery remained tough and the flavors didn’t develop well in just 30 minutes. So for round 2 it kind of morphed into a recipe similar to this One Pan Gnocchi with Sun Dried Tomatoes & White Beans. Although today’s chicken skillet is definitely saucier. Bread dunkers, rejoice! I love recipes like this because it’s so rustic. You don’t have to worry about perfect chopping technique, you just coarsely chop everything up and it all gets cooked through. That plus you get an amazing amount of flavor considering how simple it is. I like to thank some white wine (you cook it down so the alcohol should be no problem), some fresh rosemary, and the sun dried tomatoes for that. And despite this Tuscan chicken skillet being what I classify as ‘comfort food’, there are a lot of veggies hiding in here: at least 5 cups worth! 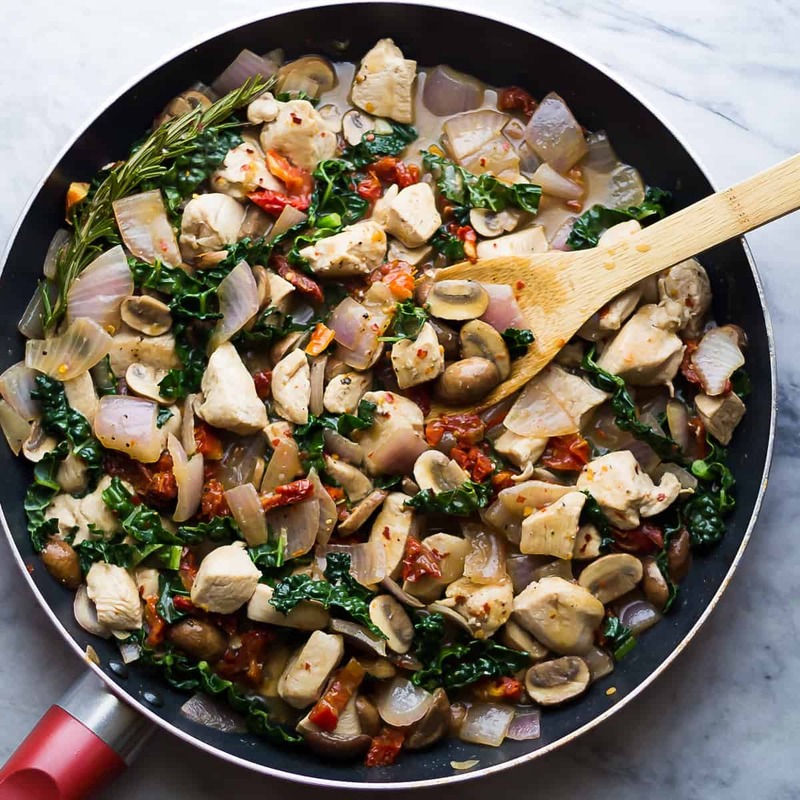 A rustic Tuscan chicken skillet that is full of flavor and ready in under 30 minutes. Don't forget to serve with a chunk of bread to sop up the sauce! Heat oil in a large non-stick pan over medium heat. Add the onion and cook for 2-3 minutes, until softened slightly. Add the mushrooms and cook for 3 more minutes. Remove the onions and mushrooms from heat and place them in a large bowl. Add 1 tablespoon flour and ¼ teaspoon salt, and toss to coat. Add additional oil to the pan if necessary. Add the chicken breasts and season with salt & pepper and red pepper flakes. Cook for 5-7 minutes, until there is no pink when you cut into one. Add the white wine and rosemary, and cook for 1 minute. Add the chicken stock, sun dried tomatoes, and return the mushrooms and onions to the pan. Cook, stirring for 3-4 more minutes, until sauce is slightly thickened. Stir in the kale and stir until wilted. Serve with a chunk of bread to sop up extra sauce. Great and delicious meal! I made it last night and it paired really nicely with some wild rice. Only thing I’d have to say though is it takes longer than 30 minutes to make. 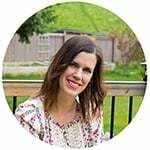 Hi Sarah, thanks so much for your feedback! Glad you enjoyed. What can I use instead of wheat flour? I could literally eat this for every meal of the day, gorgeous!! Totally laughing about the smarties thing over here! Lol! But also craving this skillet dish because it looks so good, Denise! Aww…I bet Kai was so cute. Farties – lol. This skillet looks fabulous. Love love love all the veggies in there! Oh my gosh, Kai is adorable!! You are going to have to remind him of that when he’s a teenager! We shut the lights off and pretended like we weren’t home haha! 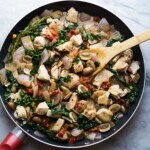 This skillet dinner looks so hearty and perfect for the cool weather we are finally getting! Glad you guys had a fabulous Halloween! Kai seriously sounds like the cutest!! I mean farties?! Awesome. 🙂 I am looooooooving this rustic skillet chicken, girlfriend! This looks so flavorful and comforting AND I love that it’s so quick and easy! Weeknight winning for sure! Pinned! Cheers! Kai seriously just made my day. Oh my gosh, that is SO adorable! You should totally take a video of him asking for his farties! LOL. 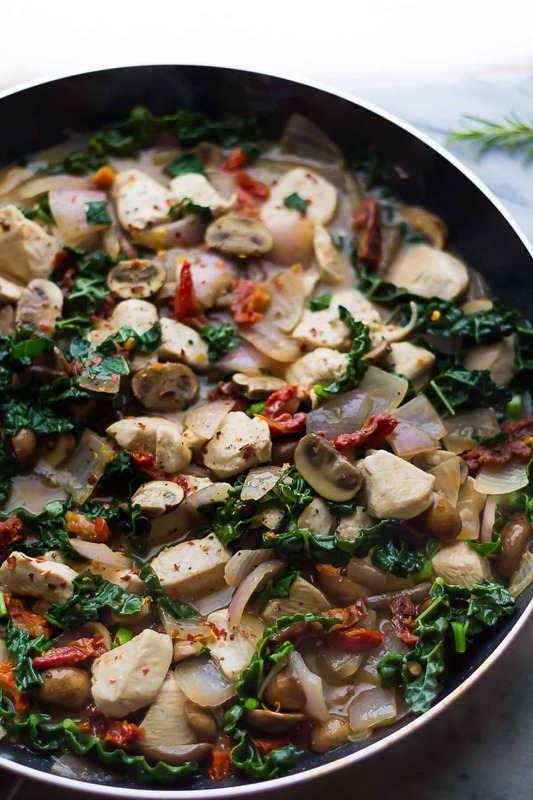 And this skillet = NEED in my dinner life tonight! Love anything tuscan-style! Bahaha farties, I love it! Kids say the cutest things. So glad Kai had fun! 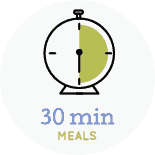 And ya for more 30 minute meals! This chicken skillet is calling my name. Love the mushrooms and sun dried tomatoes in here!